Dussehra SMS in English 2019, our collection is to those who are celebrating Dussehra, you can use our quotes and wishes to send and share with friends and family members on the digital world. 1. The time for the celebration of the victory of the good over the evil has arrived. Let's continue the same spirit. 2. Enjoy the victory of good over the evil. 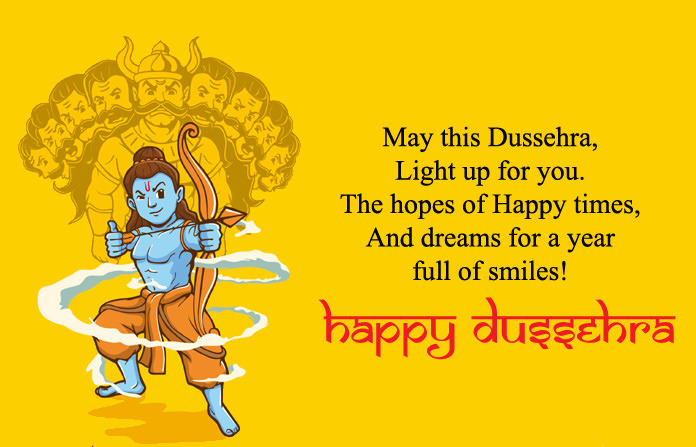 May you have a fun-filled and blissful dusshera. 3. May God shower his choicest wishes over you and remove all evil obstacles in life. 4. May lord rama keep lighting your path of success and may you achieve victory in every phase of life. Jay shree ram. 5. On this auspicious and pious occasion, I pray to lord rama to bless you with honor, dignity, and success. 7. May truth always win and good triumph over evil. May lord always bless you with wisdom. 8. May this dusshera all worries, problems and obstacles in the path of success get burned with the effigy of ravana. 9. May the demon in you always get defeated and the angel in you always control your thoughts. Remember to work and not to regret. Dussahra and you may be capable of defeating all evils of your life. Vijayadashami also was known as Dussehra or dasara or dashain or tenth day of Navratri or durgotsav is Hindu festival celebrated in october. It is one of the most important festivals celebrated in various forms, across India, Nepal, Sri Lanka, and Bangladesh. Troubles as light as air, love as deep as the ocean, friends as solid as diamonds, and success as bright as gold- these are the wishes for you and your family on the day of dussehra! Jyot se jyot jagate chalo. Prem ki ganga bahate chalo. Rah mein aaye jo deen dukhi. Sabko gale se lagate chalo. Din aaygega sabka sunehra. Isliye meri oar se happy dussehra!